Surprisingly, Nike has outgrown Under Armour in earnings per share over the last two years. 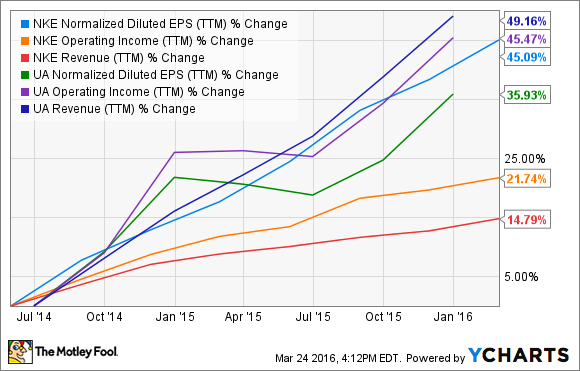 Quick: Who's growing faster -- Nike Inc (NYSE:NKE) or Under Armour Inc (NYSE:UAA)? It seems like a simple enough question. After all, Nike is the familiar veteran of the sports world, a global powerhouse that's been around for nearly 50 years. Under Armour, meanwhile, is the scrappy upstart with a sky-high valuation and seemingly endless growth ahead of it. So it's gotta be Under Armour, right? Not quite. The short answer is: "It depends." While Under Armour has grown revenue and operating income faster than Nike over the past two years, earnings per share -- the category that investors are paying for -- has actually grown faster at Nike. The chart below provides a closer look. Let's take a closer look at how the companies' margins stack up in recent reporting periods. While Under Armour makes slightly more money on actual product sales, Nike more than makes up for it with lower operating costs. But its biggest advantage seems to be the lower tax rate it pays. In the first three quarters of its current fiscal year, Nike's tax rate fell from 23.6% to 17.9%, which it credited to an increase in sales from outside the U.S., increased recognition of foreign tax credits and other adjustments and credits. Had Nike's tax rate remained the same, its earnings per share would have grown by 15% instead of 23%. Once Nike moves into its next fiscal year, starting June 1, it will likely fall behind Under Armour in EPS growth, as revenue is the major driver of long-term earnings-per-share growth. In its most recent quarter, Nike grew revenue by just 8%, though currency-neutral sales increased by 14%. Under Armour, meanwhile, has posted revenue growth of 20% or more for 23 straight quarters, an incredible streak in the apparel industry. Over the long term, Under Armour's growth rate should exceed Nike's, but the advantage of a lower tax rate shouldn't be forgotten. The difference between Nike's tax rate and Under Armour's will save the Jordan-maker nearly $1 billion a year. That's enough money to almost entirely fund its dividend payouts, or it could contribute to the company's share buybacks, or help out with research and development. In its most recent quarter, Nike repurchased $1.5 billion in stock. Under Armour, meanwhile, does not buy back stock, nor does it pay a dividend, a reflection of its priorities as a high-priced growth stock. While both companies operate similar business models, selling athletic apparel and footwear at the wholesale level and directly to consumers, Nike's lower operating costs and tax rate shows it to be the more efficient of the two companies. Ultimately, the success of the two businesses will come down to products and marketing. But both companies have shown that they can grow the overall pie in the sports apparel market, rather than simply fight over market share. Given their track records, brand power, and market opportunities, I'd expect both stocks to continue to outperform.